James Bond memorabilia auctioned off by Christie’s auction house yielded $2.6 million on October 5 and continuing online through October 8, 2012–“Global James Bond Day”–in an invitation-only charity event commemorating the British spy’s 50th anniversary on the silver screen and the release next month of the 23rd Bond film, Skyfall. The auction took place at Christie’s auction house in London, and was attended by former Bond Roger Moore and the current M, Dame Judi Dench. Bidders from more than forty countries also participated in online bidding. At only 52 lots, a small number for a major entertainment or franchise auction, it was a pretty big haul. Some high-end prop and costume buyers were in 007 heaven. The catalog, available for download here, is one of the best film auction catalogs to date, and features at least one piece of screenused costumes, props, or rare books or marketing material from each Bond film. 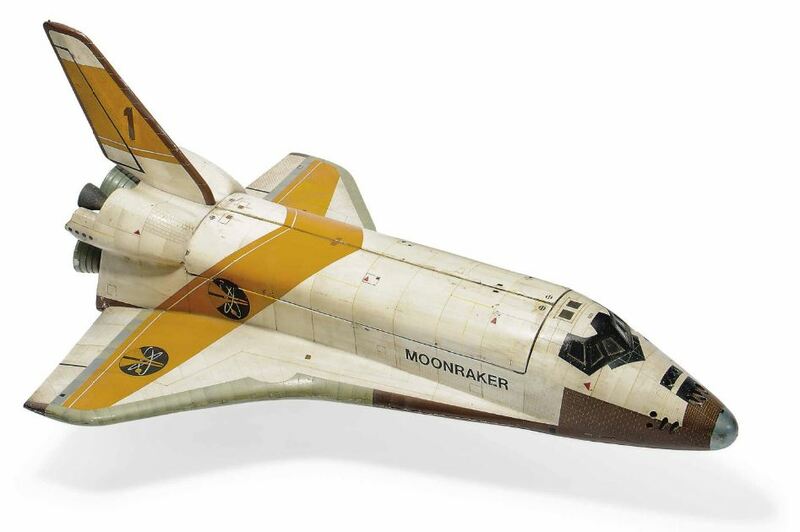 The coolest and most unique piece of James Bond history that sold is one of the original models of the space shuttle Moonraker 1 from the 1979 film Moonraker, which sold for $88,800. In the film the shuttle was created by Drax, and Moonraker 1 was the first to be launched from Drax’s control center in the Amazon to transport his selection of perfect human specimens to his space station, where he plans to wipe out the human race on earth and re-create humanity with his master race. The Moonraker was based on the actual NASA Enterprise shuttle design. 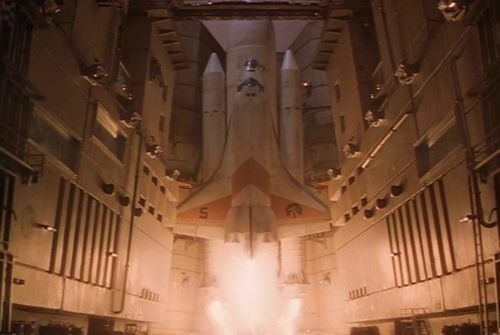 The film’s release was originally planned to coincide with the first launch of the real space shuttle but since the NASA space shuttle program had not yet been launched when Moonraker was made, designer Derek Meddings and his team had to create the launch footage with no frame of reference for a shuttle launch. 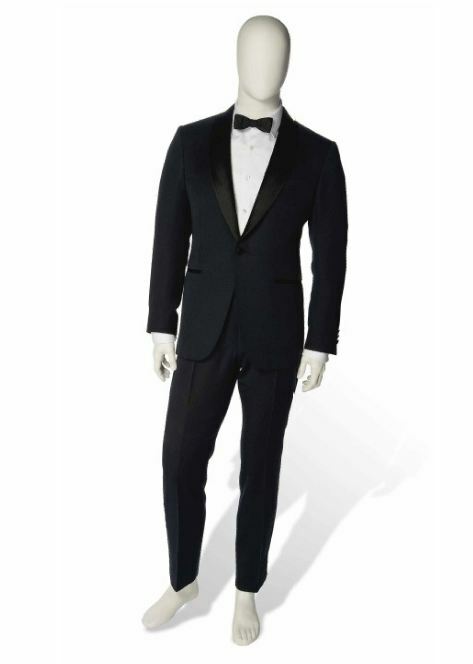 The famous classic Bond suits sold well: a Timothy Dalton suit from The Living Daylights and Bond girl Maryam d’Abo’s Kara Milovy dress sold in one lot for $24,100 and a Pierce Brosnan suit from The World is Not Enough sold for $26,100. 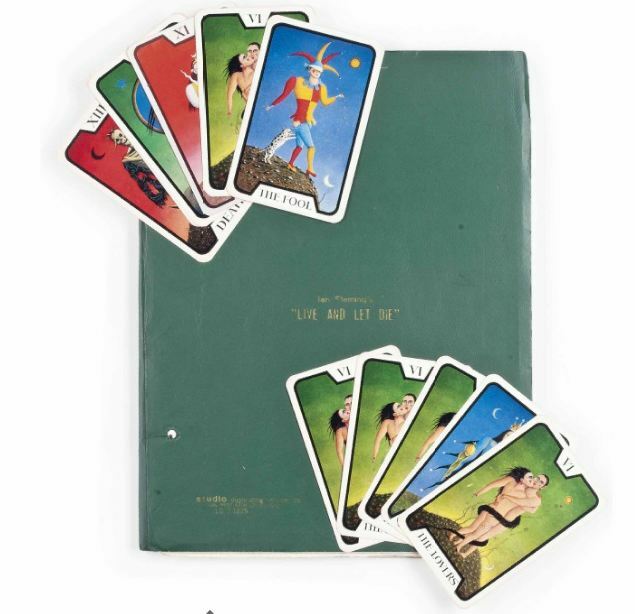 A set of tarot cards used by Bond girl Jane Seymour as Solitaire in Live and Let Die sold for $48,200. 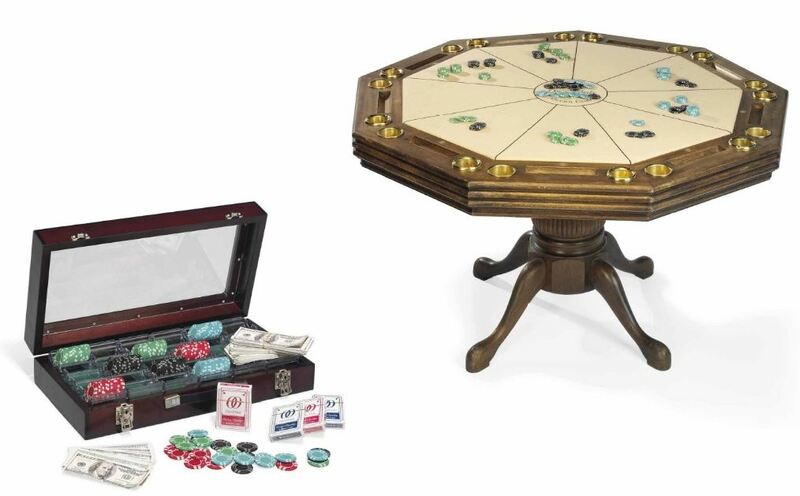 A poker table from Casino Royale sold for an amazing $137,000. Several pieces of iconic Bond prop jewelry also sold well, from watches to cuff links. The Algerian love knot necklace worn by Eva Green in Casino Royale sold for $88,800. And it wouldn’t be a Bond auction without some Bond cars. A prototype BMW Z8 Roadster replica made for The World Is Not Enough sold for $137,000. The in-person auction on October 5 offered only eleven of the 52 lots, mainly from the films featuring Daniel Craig as Bond, including a Tom Ford wool suit worn by Daniel Craig in Skyfall that fetched $75,756, Craig’s “Seamaster Professional Planet Ocean” watch from Skyfall that sold for a whopping $254,273, Craig’s swim trunks worn at the beginning of Casino Royale, which sold for $71,876, and the 2008 Aston Martin 6 Litre V12 DBS 2-Door Coupe driven by Daniel Craig as Bond in Quantum of Solace, which sold for $390,101. Clearly the Daniel Craig movies can hold their own against previous Bonds with fans with deep pockets. To top it off, this Sunday, October 14, 2012, check out the TV news show 60 Minutes, which will feature a news segment on the once in a lifetime Bond auction. For Borg readers so inclined, here’s a link that may provide a few minutes of harmless diversion. The production values are hardly up to Mr. Meddings standards, but their creation was heavily influenced by him. A true Blast from the Past, from a time when giant robots still ran rampant and salivating monsters unashamedly flaunted their silvery wires.